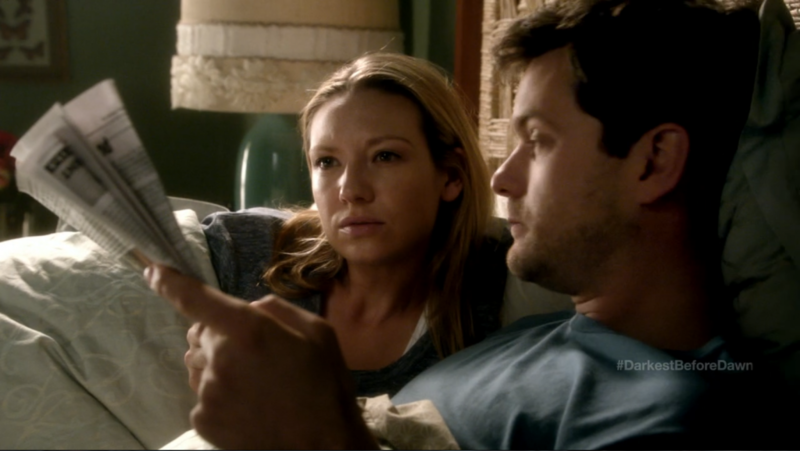 Its been a while since I have posted reviews of Fringe, quite frankly my studies have kept me very busy and the episodes of season 4 have so far been just tad under par compared to earlier seasons. They were for the most part still good and I am also happy to announce that Fringe has been confirmed for a fifth and last season that will span 13 episodes. That will bring the total to 100, the magic number for selling series abroad to other TV channels. As for season 4, the finale is a two parter of which I will be reviewing the first part now. It’s entitled ‘Brave New World, a title also used by Aldous Huxley but as far as I know there is no connection between the works. Brave New World Part 1 also sees the return of Leonard Nimoy as William Bell, who has returned from the grave as the antagonist. 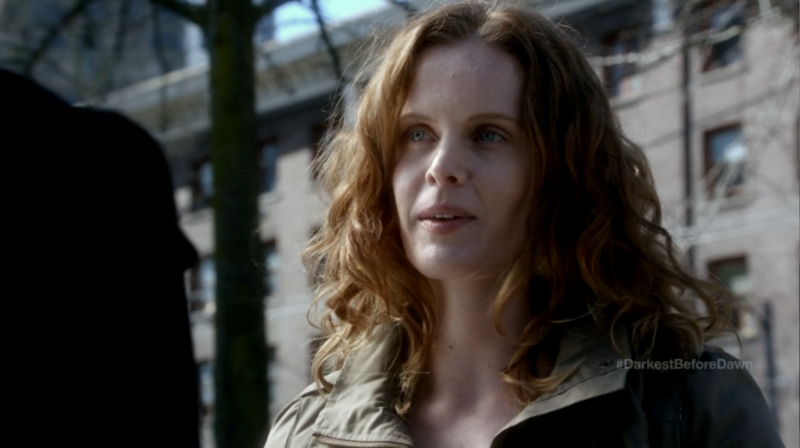 Another actor making an appearance is Rebecca Mader whom most best remember as Charlotte Lewis from Lost. Several people in an office complex suddenly show signs of spontaneous combustion and die; others witnessing it realize that the symptom is onset by movement and stand perfectly still as help arrives. As Fringe investigates, they find a device planted in the building’s escalator system that released nanites into those that rode it, triggering the combustion by body movement. 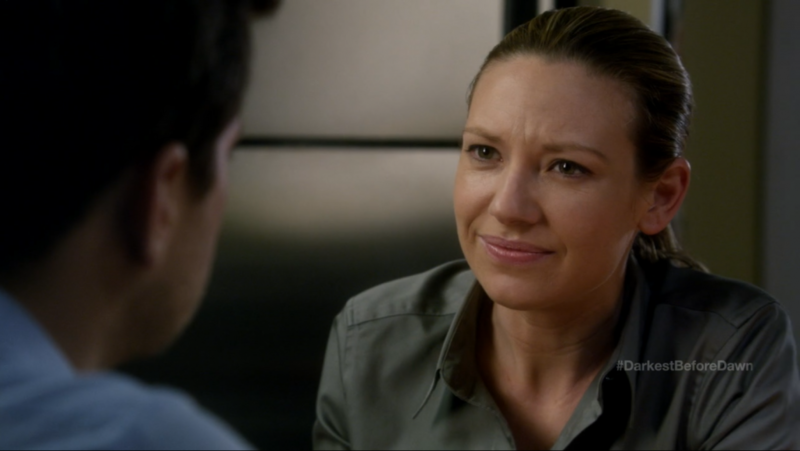 One survivor, Jessica, offers to be a test subject for Walter and Peter Bishop as they discover a cure. When Jessica’s body temperature starts to rise before the cure is synthesized, Olivia uses her Cortexiphan powers to slow her system, which stops the nanites and enables Peter to introduce the cure to her system. The Fringe team finds that David Robert Jones had planted the device, and worry that despite the deactivation of the bridge, he is still trying to collapse both universes to create a third one. 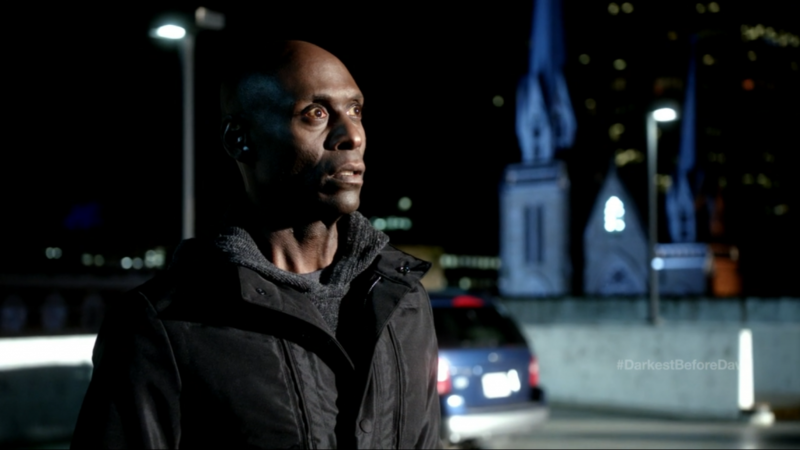 Walter studies the design of the device and recognizes that the nanites were not developed by Jones but by William Bell, and begins to suspect Bell is alive. Nina Sharp rejects this theory, explaining that Bell had purposely died in a car accident in 2005 to end his suffering from lymphoma. Walter returns to St. Claire’s Mental Institution and finds the scent of Bell among the log books when Walter believed he had visited, and continues to assert this claim. Unknown to Fringe, Jones reports to William Bell aboard the container ship (“Nothing As It Seems“) about the success of the nanites. Bell ponders this over a chessboard that he states he has played for forty years, and instructs Jones to his next action, commenting that sacrificing a bishop may help him win the game. Later, a column of light suddenly appears over Beacon Hill, burning a hole through a building and into the ground. Walter identifies it as sunlight, reflected to satellites likely under Jones’ control, aimed to ignite an oil reservoir deep below Boston. He directs Peter and Olivia to the most likely site Jones is controlling the satellites from. They find two antennas that must be disabled simultaneously, requiring them to split up to do so. Though they are successful in stopping the beam, Peter is attacked by Jones. 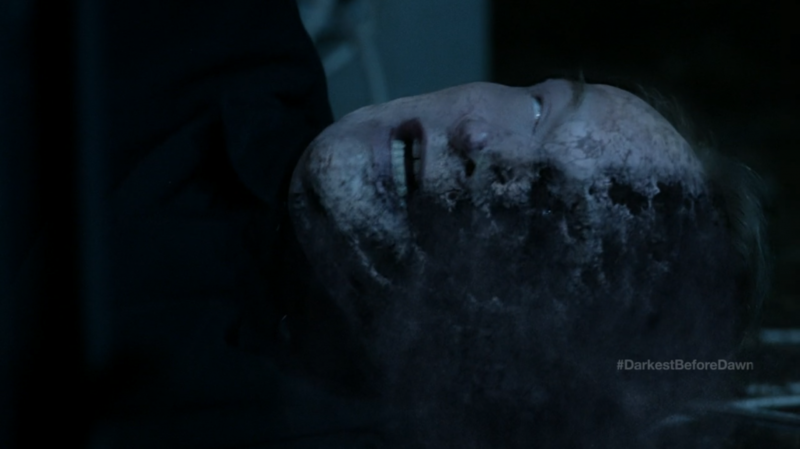 Olivia finds her Cortexiphan powers reinvigorated, and is able to control Peter’s body, letting him get the upper hand and throwing Jones into the antenna. The electrical shock sends Jones’ body into deterioration, and realizes too late that he was the bishop to be sacrificed. Walter discovers evidence of Chilean almonds on one of the log sheets from St. Claire’s, Bell’s favorite food. He and Astrid travel to the warehouse of the shipping company that imported the almonds, finding it abandoned with one man, armed with a gun, stating the company went out of business three years earlier. Astrid implores Walter to leave but they are enticed by a strange sound from the back of the warehouse, finding several shipping containers being moved about with the noises coming from them. They are discovered and flee. Astrid is shot, and as Walter tends to her, William Bell appears, reintroducing himself to his old friend. 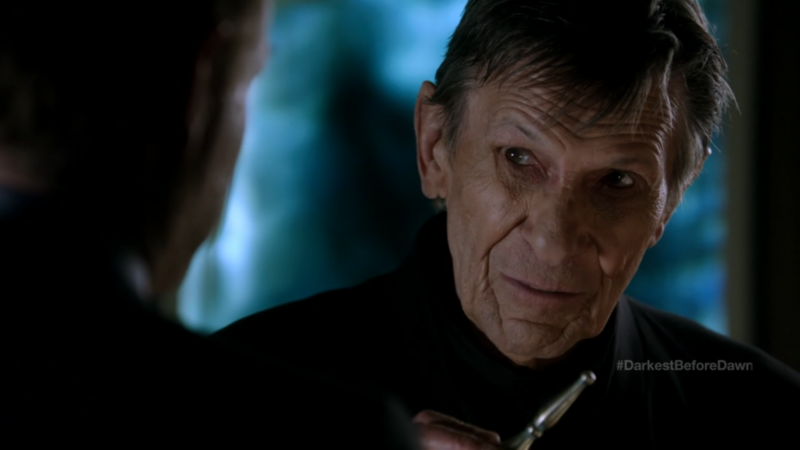 The episode marked an odd turn for Fringe, at first it was strange that the other universe was barely referred too, another strange twist was the return of Leonard Nimoy as William Bell. Bell is now an antagonist with no motivation, and that feels confusing and out of character for Bell. the death of David Robert Jones was bit underdone, Fringes creative staff had used him well in this season (and so probably prevented a ratings drop) and yet in this episode he killed off in a rather understated way. Of course we need to remember that at the beginning of the season Peter has turned on the machine and had reset time, creating a new timeline with its own history. After the three earlier seasons that is almost easy to forget, I had forgotten that in this timeline William Bell is supposedly dead and that Olivia has more Cortexiphan abilities. All these changes need time to sink in and thus I am glad that the second part of Brave New World didn’t air right away. Some of the creative decisions may be criticised but they also feel gutsy! Viewer ratings; 2.851 million (which is under par for the season). Fringe ‘And Those We’ve Left Behind’ Review! Next story Star Trek Novels Update! Previous story Prometheus 3-minute trailer arrives!